Before I get into all the details of the curry, I’ve got to tell you, this recipe was a hit! It was exotic and incredibly tasty. In fact, it was so delicious, Piyush has been asking me to make it every single day since he finished it. That’s definitely not like him…so I know I must have done something right! I wasn’t entirely certain what I was going to make for our anniversary dinner, but since I had taken some chicken thighs out of the freezer the night before I figured I better create something around those. So, I looked through the pantry and found some coconut milk, then opened my spice cabinet. 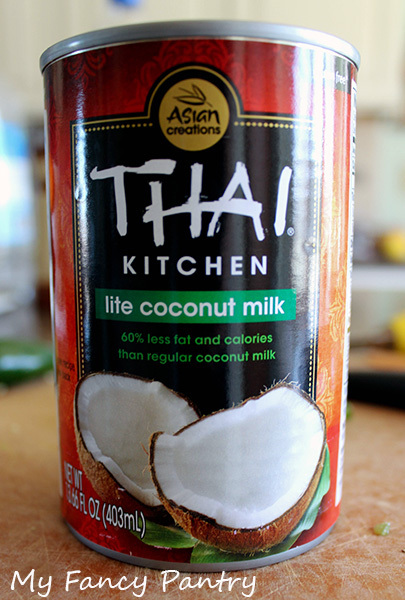 I use Thai Kitchen brand coconut milk. I just like the taste better than most others I’ve tried. 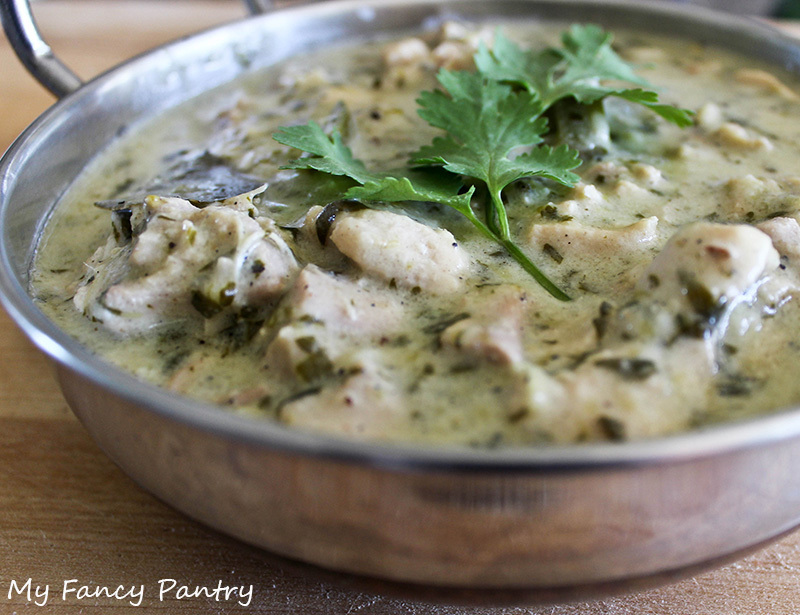 I thought about recreating the chicken curry we order from our favorite restaurant, then I thought about making coriander chicken curry or even a chicken dopiaza. None of those curries really excited me though, so I decided to grind up some fresh cardamom and try something new. 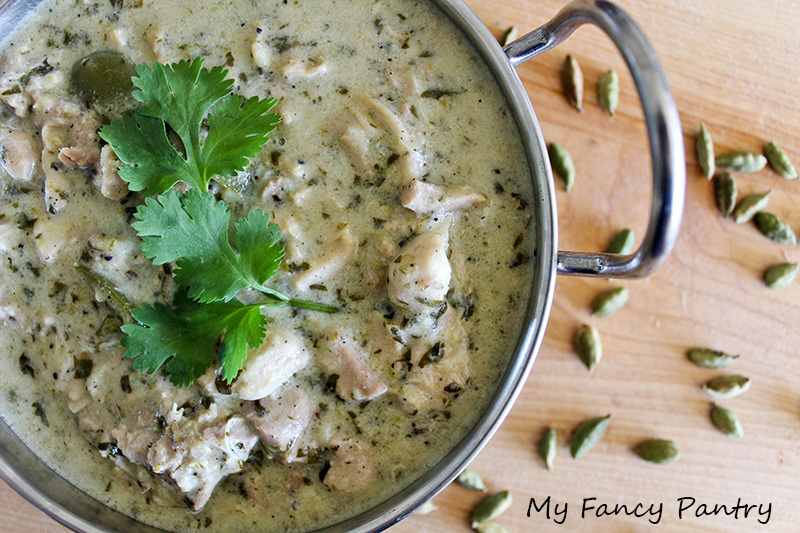 Green cardamom is one of my favorite spices and I knew it would pair well with the coconut milk. 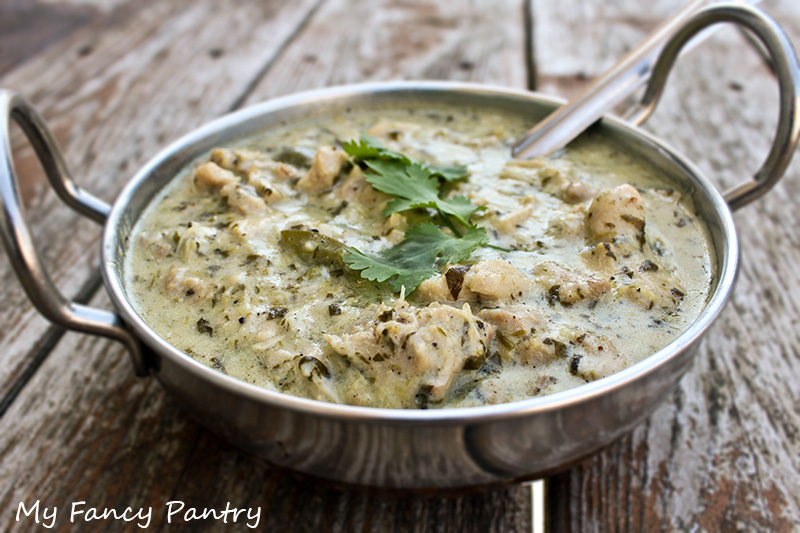 It has such a unique flavor–one that can be used in both savory and sweet foods–so I figured tossing some in a chicken curry would taste pretty awesome. Grinding your own cardamom is easy. Simply smash the green pods and remove the black seeds inside. 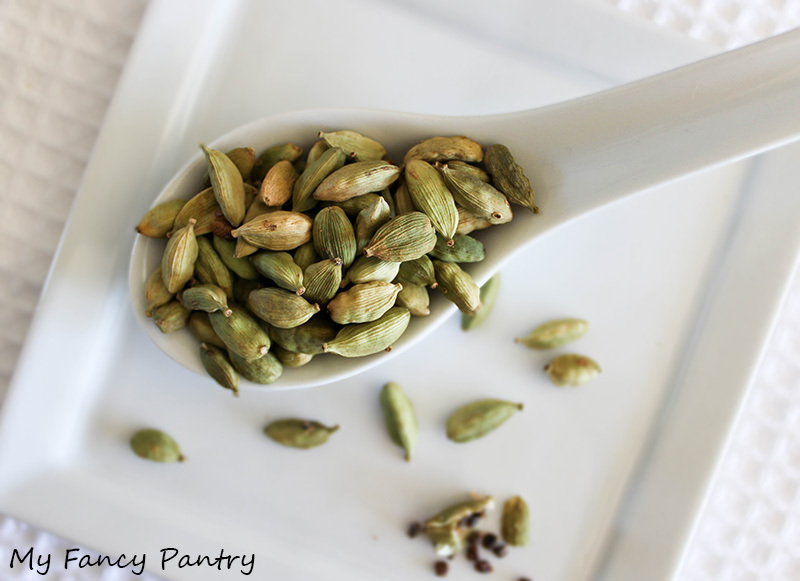 If you’re feeling a little lazy (like I often do), you can purchase just the cardamom seeds from the Indian market instead of the full pods. Place the seeds in a spice grinder (I use a coffee grinder) or grind them using a motar and pestle. The powder keeps for a few months as long as it is stored in an air-tight container and kept in a cool, dark place. 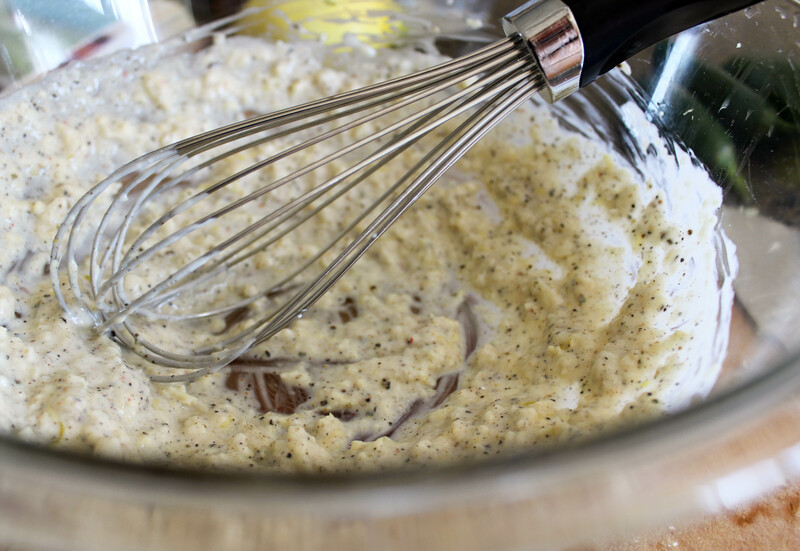 I began by making a quick marinade with some garlic, ginger, lemon, yogurt, salt, pepper and cardamom. I then tossed the chicken in the marinade and let it sit at room temperature while I figured out what to do next. After the chicken had marinaded for about a half hour, I tossed some ghee in my dutch oven and turned the flame to medium high. I didn’t want to go overboard with spices because I wanted the cardamom and coconut milk to really shine. I thought it needed a little something extra though, so I tossed in a couple bay leaves. Then I dumped in the chicken. Once the chicken began to brown and was nearly cooked through, I tipped in some whipped yogurt and the coconut milk. Then, I added some chilies and chopped coriander. 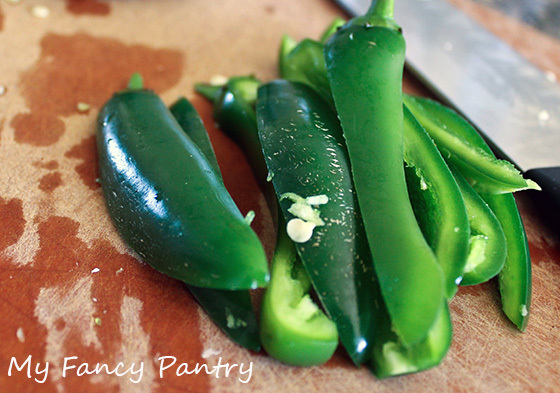 Jalapenos were all I had on hand. At this point, I began to worry a little. The curry was awfully runny and there was just too much liquid! I’ve said a million times how I don’t have any patience, so right away I began to worry. But then I surprised myself. Instead of dumping out the excess liquid (and there was an excess! ), I sat down, wrote a panicked Facebook status (actual status: Creating a new curry…so far, it doesn’t look promising! Here’s to hoping it turns out! ), and waited. The curry was still quite liquidy, but I figured it’d thicken up eventually. So, yet again, I walked away. Another 10 minutes passed, and finally my curry was done! The gravy really did thicken up nicely, and the flavor was incredible! The chilies, the cardamom, the coconut milk…everything blended together beautifully! 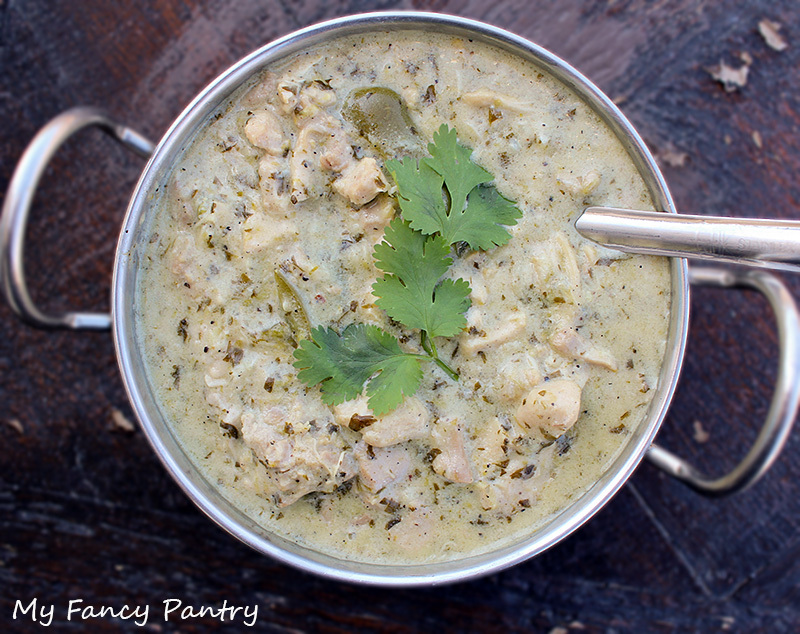 The Coconut and Cardamom Chicken Curry was the perfect anniversary dinner! Piyush loved it! …and I think you will too! Mix 1/4 cup of yogurt, 1/2 tsp. ground cardamom powder, garlic, ginger, some black pepper, salt and lemon zest in a large bowl until it’s the consistency of a thick paste. 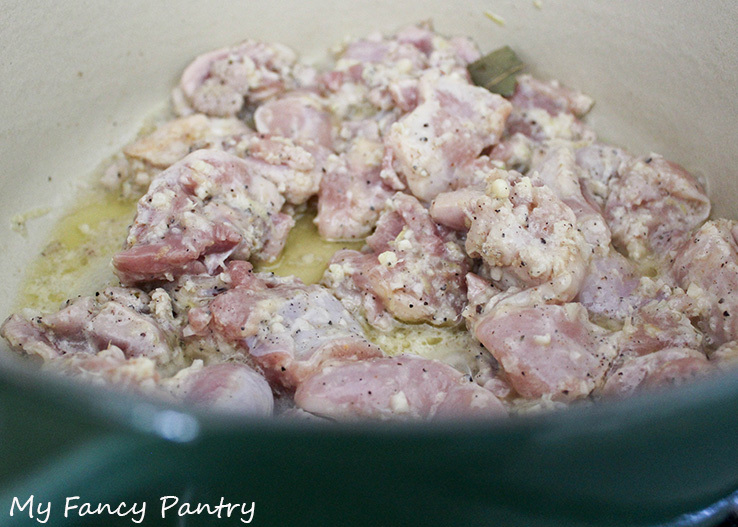 Add the diced chicken to the paste and stir so that all the chicken is evenly coated. Set aside at room temperature for 30 minutes or refrigerate for at least 2 hours. Allow meat to come to room temperature before cooking. Heat the ghee in a large pan (I used my dutch oven) over a medium-high flame and add bay leaves and the marinaded chicken pieces. 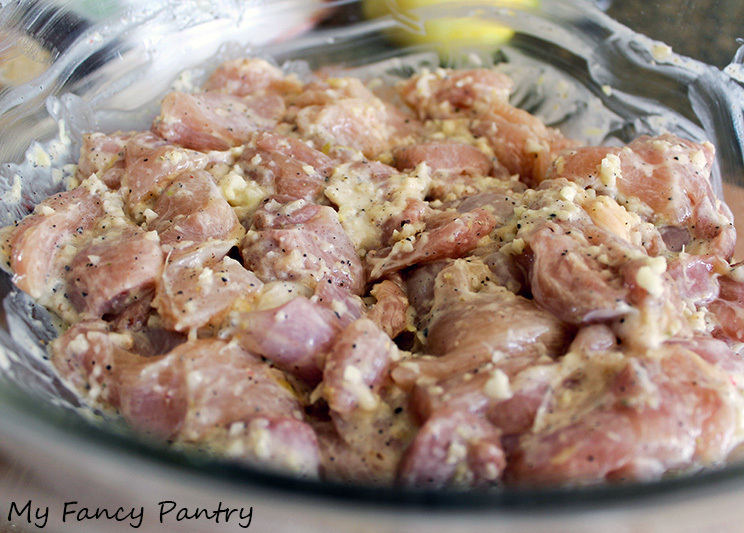 Scrape in any additional marinade. Cook the chicken for about 5 minutes or until the pieces begin to brown. 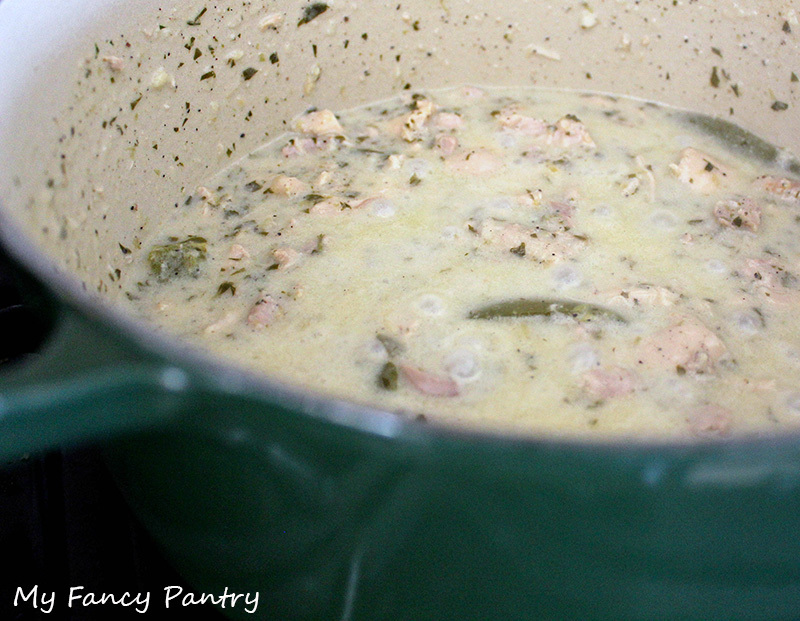 Add 1 cup of whipped plain yogurt and 1 can of coconut milk to the chicken. Stir well. The curry will be very, very runny at this point. That is okay. Allow the curry to come to a boil then turn the heat to medium, toss in the remaining 1/2 tsp. of cardamom powder, the chopped coriander and green chilies. Turn down the heat to medium. Add a couple tablespoons of lemon juice and allow the curry to simmer for about 20 minutes or until a majority of the liquid has evaporated and the curry is your desired consistency. Season with salt and pepper to your taste. Serve with rice or roti (Indian bread). Enjoy! As for The Great Gatsby, I wasn’t impressed with the movie. The costumes, sets, clothes and jewelry were spectacular and Leonardo did a great job (although I thought he was a little mis-directed), as did Carey Mulligan (she is just too dang cute! ); but Tobey Maguire irritated me! Actually, he had me disliking the movie within the first 3 minutes, believe it or not. I really felt he was miscast. Considering that F. Scott Fitzgerald is one of my absolute favorite authors and I love all of his work (especially This Side of Paradise), I’m really not surprised I didn’t care for the movie. Just saved this recipe. Looks so good! I never had cardamom chicken, so am looking forward to trying it. Happy Anniversary! Lovely recipe and photos. Redford will always be the film Gatsby for me. Though the book surpasses any attempt by film to recreate the era. Happy anniversary! I tried Indian food for the first time a few months ago, and now I am hooked! This recipe looks so good, I will have to try it!! lovely looking curry! I am glad you had patience with it 🙂 hmm, I read the book, but I haven’t seen any of the Gatsby movies…I wonder if I would enjoy it. I am often disappointed when I watch movies after reading the book…the books are almost always much better than the movies! You had me at cardamom and coconut but the rest of the ingredients are even more mouthwatering! Love the mix of south and north Indian flavors in this recipe:) Congratulations on your anniversary! Wow Shari, that’s an awesome dish 🙂 Love it! Happy b’lated Anniversary to you both! Tried this recipe and I must say, it was very tasty. . . Happy anniversary, and may you have many more! This recipe is DELICIOUS. Definitely a keeper!!! This looks and sounds amazing. 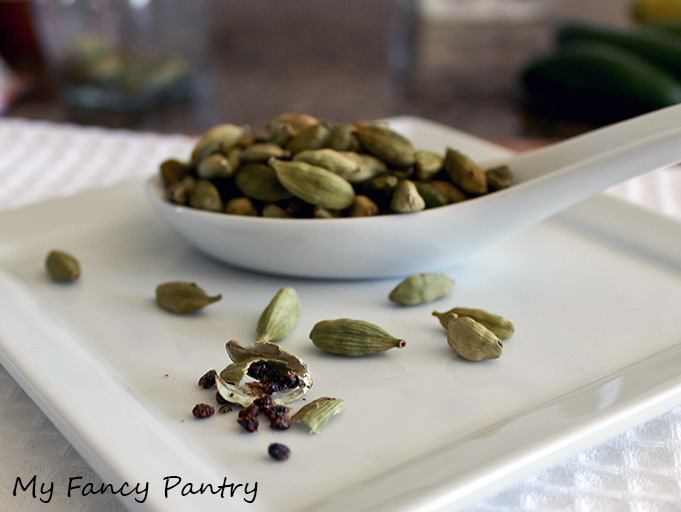 I am such a sucker for anything with cardamom (and for coconutty curries of course…). Seems like the perfect anniversary dinner to me! I’m so happy you enjoyed the curry! I think ground coriander would actually be a nice addition to the curry! I haven’t used Penzey’s spices, actually. Unfortunately Rochester doesn’t have many options for shopping. I’ve also found that shopping at the Asian stores or the Indian market is usually cheaper—and the quality is still great. May you have many dozens of happy anniversaries surrounded by loved ones all the days of your lives. Looks very delicious, and probably would be wonderful over pure buckwheat noodles or whole wheat chapatis to reduce glycemic load, something Indians need to watch out for, early in their lives! Do you think that some chunks of chayote or raw papaya stewed together with the chicken might add a low-calorie veggie to this excellent dish, for a weeknight preparation? Re: liquidy, some people LOVE more gravy, so worry NOT!! Besides, if you eat this with hot crusty bread, all that delicious liquid will be just right! It really depends on what you are sopping it up with, and your preferences, isn’t it? I think adding papaya to this curry would be excellent! Thank you for the suggestion, Gautam! Great question! I do often make curries with few ingredients, but they are usually simple-homestyle preparations. I could definitely add a few quick Indian recipes with short ingredient lists to the blog. This looks so great! I look forward to trying it out, so easy, yet looks so tasty! It reminds me of an Swahili dish called kukupaka (its a chicken coconut curry with indian/middle eastern/african influence). The dish is especially famous in Zanzibar, Tanzania and if you haven’t tried it out, you must! Kukupaka sounds like something I will have to check out! Thanks for the info! 🙂 I hope you try (and enjoy!) the curry! Reblogged this on Morgan E Rasmussen . Just made this for lunch. I love cardamon and the flavour was amazing. The texture, though, was a little grainy, which I suspected might happen when it said to simmer yogurt for a 20 mins? I wonder if you add the coconut milk and simmer that and then add yogurt at the end before serving? I also wasn’t sure why the yogurt was supposed to be whipped? Why? Hello Heather! I’m unsure why the curry became grainy–sorry about that! I don’t know that it’s the yogurt though. Mine never does that. The yogurt has to be whipped else it won’t combine into the curry well–it becomes more like adding cream (since it’s a substitute of cream in a curry). It’s a little tip/technique I picked up. 🙂 You’ll definitely notice a difference in your curry if you whip the yogurt rather than adding it straight.